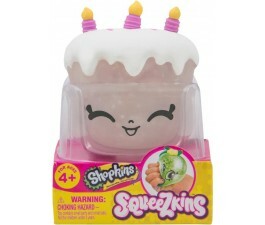 Children who love collecting small figurines are going to love the Shopkins. These adorable little figurines are inspired by popular items you can buy in stores. There is even one called Tommy Ketchup. Like many collectible figurine toys, these come in a variety of rarities and series. You can get your little one started slowly with a double pack, or you can get her a twelve pack that might just give her the chance to find a couple of rare ones. Grocery shopping has never been more fun! Your child enjoys a big adventure in the small world of the tiny Shopkins. These super small and grocery-themed collectable toys are mini-replicas of every item in the grocery store. Crafted with exquisite details to delight kids of all ages as they imagine shopping and stocking their very own supermarket. Each authentic design resembles actual supermarket store items and offers a non-stop shopping experience for girls, boys or adults who love to collect toys. With over 140 distinct characters, these whimsical figurines encourage collecting, trading and imaginative play time. 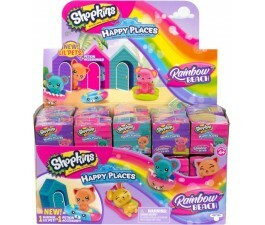 At Mr Toys, we have a vast selection of the Shopkins products online. 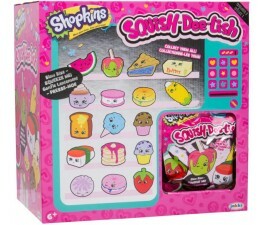 When you want to buy the whimsical pieces of Shopkins online, look no further than Mr Toys. We offer customer service 24 hours a day and are always available to assist you with your questions. When it’s time for fun, why not satisfy hungry appetites with the tiny Shopkins Cutie Cars drive through toy set? Like all the Cutie Cars Mini Shopkins line, this mini set is large enough to fit all the imaginary people inside and has a lifelike revolving drive-up window that invites even the most discriminating guest to join the group for dinner.